This guide provides instructions for creating and managing reports, feeds, and widgets in Red Hat CloudForms. It also includes information on accessing usage and timeline data, and chargeback costs. This information supports better information technology decision making and predictions for future virtual machine management. Cloud Intelligence shows your virtual environment’s events, reports, and configurable alerts. This information supports better information technology decision making and predictions for future virtual machine management. When you log in to the console, it brings you directly to the Cloud Intelligence Dashboard page by default. The console uses widgets to organize this page, providing you with a default set of commonly used widgets. The configuration items on these widgets are clickable, allowing you to drill down directly to a referenced item. Customize this page to include the charts, reports, and RSS feeds you specifically want to see as soon as you log in to the console. You can add, remove, move, minimize, zoom into, and maximize widgets. Only users with the proper access can create widgets. You can add widgets to the dashboard to accommodate the information you want to see upon login. Navigate to Cloud Intelligence → Dashboard. Select the widget you want to add from the list. Only widgets that are not currently showing on the dashboard will appear in this list. Click (Reset Dashboard Widgets to the defaults). You can remove a widget when you no longer need the widget to be displayed in the dashboard. From the widget that you want to remove, click (Remove from Dashboard) in the upper right corner of the widget. The widget is removed from the dashboard, but it is not deleted. It can be added again if needed. From the chart widget that you want to enlarge, click (Zoom in) in the upper right corner of the widget. The enlarged chart is opened in its own pop-up window. To close this window, click (Close) in the upper right corner. From the chart or report widget that you want to enlarge, click (Open the chart and full report in new window) in the upper right corner of the widget. From the chart or report widget that you want to maximize, click (Minimize) or (Full Screen) in the upper right corner of the widget. From the chart or report widget that you want to download as a PDF, click [(Download PDF) in the upper right corner of the widget. Navigate to Cloud Intelligence → Reports. Click on the Dashboard Widgets accordion, then choose the Reports folder. Click (Configuration), then click (Add a new Widget). In the Basic Information area, type in a Title and Description. By default the widget will be active as soon as you create it. To make it inactive, uncheck the Active box. From the Report Options area, select the filters until you are at the report you want for this widget. Select up to four columns from that report. Finally, for Row Count, select the number of rows that you want displayed. In the Timer area, click the Run drop down to specify how often you want the widget data to get updated. The options displayed will depend on which Run option you choose. Select Hourly, Daily, Weekly, or Monthly. Select a Time Zone. Type or select a date to begin the schedule in Starting Date. Select a Starting Time based on a 24 hour clock in the selected time zone. If you change the time zone, you will need to reset the starting date and time. In the Visibility area, select <To All Users>, so that all users can use this widget no matter what user role they are assigned. Select <By Role> to assign this widget to specific user roles. Select <By Group> to assign this widget to specific groups. Click the Dashboard Widgets accordion and click the Charts folder. From the Chart Report area, select a chart to display in the widget. Click the Dashboard Widgets accordion, and click the RSS Feeds folder. From Type, select Internal to use feed from Red Hat CloudForms. Then select the RSS feed, from the Internal RSS Feed dropdown. From Type, select External to use a feed outside of Red Hat CloudForms. Then, either select the RSS feed or type your own. From Row Count, select the number of rows you want returned from the RSS feed. Select the Filters until you are at the report you want for this widget. Select up to three columns from that report. Finally, for Row Count, select the number of rows that you want displayed. Type or select a date to begin the schedule in Starting Date. Select a Starting Time (UTC) based on a 24 hour clock in the selected Time Zone. Click the Dashboard Widgets accordion and click the Menus folder. In the Menu Shortcuts area, use the Add a Shortcut dropdown to select all the places in the console that you want to add to this widget. Click the Dashboard Widgets accordion and select the widget you want to edit. Click (Configuration), and then (Edit this Widget). Click the Dashboard Widget accordion, and select the widget you want to copy. Click (Configuration), and then (Copy this Widget). Type a unique name for the widget and edit its properties. Default widgets cannot be deleted, but they can be copied. Click the Dashboard Widget accordion and select the widget you want to delete. Click (Configuration), and then (Delete this Widget from the Database). You can share widgets between appliances using the export and import features. In the Import/Export accordion, click Widgets. In the Import area, click Browse to select an import file. In the Export area, select the widgets that you want to export. Click the Dashboard Widgets accordion and select the widget you want to generate. Click (Configuration), and then (Generate Widget Content now). The content is generated immediately instead of waiting for the next scheduled update. Generation of widget content is shown under Settings → Tasks. Click the Reports accordion under Cloud Intelligence → Reports to see a list of reports available. These reports have been constructed to help you view the most commonly requested and significant data. From here, you can also create reports if you have appropriate access. Red Hat CloudForms provides a large group of default reports organized into categories. Each category has its own set of subfolders. Use Configuration Management to see hardware, application, network, service, user account, operating system, and snapshot information for all of your items. Use Migration Readiness to see information specifically related to items required to migrate a virtual machine. Use Operations to look at free space on registered and unregistered virtual machines, to see power states for virtual machines, and see which offline virtual machines have snapshots or have never been analyzed. You are also provided with reports specifically related to the operation of Red Hat CloudForms, such as user ids and snapshots taken by Red Hat CloudForms. Use VM Sprawl to check on usage information and disk waste. Use Relationships to see virtual machine, folder, and cluster relationships. Use Events to view operations and configuration management events. Use Performance by Asset Type to see a report on the performance of your virtual infrastructure. You must be capturing capacity and utilization data to get this information. Use Running Processes to view the information on processes running on a virtual machine. You must have domain credentials entered for the zone to collect the info for these reports, and the virtual machine must have been analyzed at least once. Trending shows projections of datastore capacity and host CPU and memory use. Provisioning shows provisioning activity based on the approver, datastore, requester, and virtual machine. For a complete list of reportable fields in Red Hat CloudForms, see Appendix B, Reportable Fields in Red Hat CloudForms. There are two different ways to generate a report: by scheduling the report, or running the report manually by clicking the report generation button on the Reports page. Red Hat CloudForms uses interactive report generation so that reports are placed on a queue. A visual indicator of the reports status is shown. All reports are automatically saved so that they can be downloaded and analyzed later. Click the Reports accordion and select the report you want to view. The report generation is placed on the queue and its status shows in the reports page. Click (Reload current display) to update the status. When a report has finished generating, click on its row to view it. You can view historical data by creating reports on a scheduled basis. In addition, scheduled reports can be emailed directly to users. There are two ways to schedule a report. Select a report from the Reports accordion and click Configuration, Add a New Schedule, or click the Schedules accordion and click Configuration, Add a New Schedule. In the Basic Information area, type in a Name and Description for the schedule. By default. Active is checked to enable the scan. Check E-Mail after Running to send an email after the report has been generated. The email will be sent to the users email address as show in the Accounts area in Configuration. The email will include a link to the report. The Report Selection area is pre-populated if you added the schedule directly from the report. If you are adding from the schedule according, use the Filter drop downs to select the report that you want to schedule. 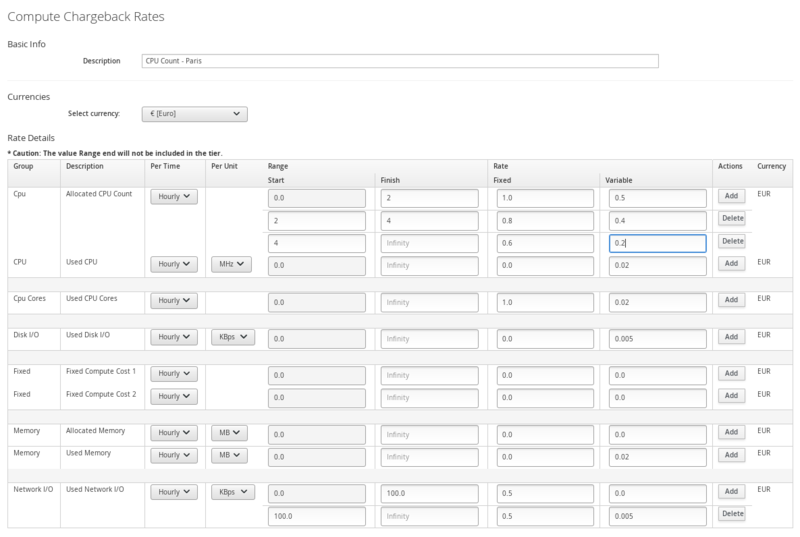 In the Timer area, click the Run drop down to specify how often you want the analysis to run. Your options after that will depend on which run option you choose. Click Once to have the analysis run just one time. Click Daily to run the analysis on a daily basis. You will be prompted to select how many days you want between each analysis. Click Hourly to run the analysis hourly. You will be prompted to select how many hours you want between each analysis. Select a Starting Time based on a 24 hour clock in the Red Hat CloudForms appliance’s Time Zone. To send an email that includes an attachment with the report contents, check Send an E-mail. Parameters required for sending an email are displayed. In From (leave blank for default), type in the sending email. Use Add a User, to select a specific user. The user must have a valid email address entered under accounts. Use Add (enter manually) to type in the address not registered to a User. If you are sending an email after the report runs, then you can select further options under Email Options. Check Send if Report is Empty if you want an email even if no records exist in the report. Next to Attachments, check if you would like the report attached as a Text, CSV, or PDF file. You may need to disable, change the report filter, or change the frequency of a schedule. To do this, you will need to edit the schedule. Click the Schedules accordion and select the schedule you want to edit. Click (Configuration), then click (Edit this Schedule). Click the Schedules accordion and select the schedule you want to run. Click (Configuration), then click (Queue). Once you have created a schedule for a report, you can view it at any time after the first scheduled time has occurred. Click the Saved Reports accordion or the Reports accordion. Click on the instance of the report you want to view. Some reports can be viewed as charts as well as lists. Note that this will depend on the type of data and on how the report has been created. Where applicable, you will see these additional buttons. Click the report to view. Click one of the following buttons for the view you want. When you click on one of the supplied reports, you are presented with a group of buttons to download the report in one of three formats or to view the report in a full screen. Edit and delete buttons are only visible to administrators and super administrators. Edit and delete functions are only available to customer-created reports. The Red Hat CloudForms pre-configured reports cannot be edited or deleted, but they can be copied. Download reports to analyze the data using other tools or to print the report. Click the report you want to view. Click on the row for the instance of the report you want to download. If the report needs to be generated, see Section 3.1, “Running Reports”. Click on the report download buttons for the type of export you want. Click (Download this report in text format) to download as text. Click (Download this report in csv format) to download as a comma-separated file. Click (Download this report in PDF format) to download as PDF. The report is automatically named with the type of report and date. View the report in full screen to zoom into the report screen. From full screen, you can also print the chart that accompanies a report. Add reports if the default reports do not include what you need or you want to narrow the scope of a report. For example, you may want a report that shows only Windows virtual machines. Click (Configuration), then click (Add a New Report). In the Columns tab, edit the Basic Report Info area. Type a unique name in Menu Name for how you want the report described in the menu list. Type the Title you want displayed on the report in title. Add fields in the Configure Report Columns area. 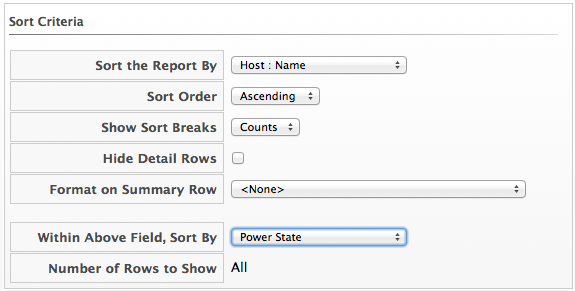 Use the Base the report on table dropdown to choose a table to get fields from. If you change the report base or the interval, all selections below will be reset. Select fields that you want in the report from Available Fields, and then click (Move selected fields down). In addition to the fields, you can also select any tags that you have created and assigned. Change the order of the fields in the report by clicking (Move selected fields up) or (Move selected fields down). Click on the Consolidation tab to consolidate and aggregate data points into maximum, minimum, average, and total. Specifically, this would be useful for analyzing performance data over a specific period of time. Note that if you do this, you will not see individual records, but rather the calculation as a column header. Select the columns to group by. For each numeric field selected in the report, you can click the dropdown under Calculations. Check the calculations you want to use. Click on the Formatting tab to set the size of paper for a PDF and column header format. From the PDF Output area, select the page size from the dropdown. From Specify Column Headers and Formats, type the text you want displayed for each field. For each numeric field, you can also set the numeric format. Click on the Styling tab to change the color of the text or the background for a row based on a condition. Use Style to select the format for the value. You can choose to change the text color or the background. Use If to create a conditional statement for the style. Click on the Filter tab to set filters for the data displayed in the report. There are two types of filters: the first is the Record Filter which is the primary filter of the main tables records, the second is also a Display Filter, which is a secondary filter of rows based on the fields of the child table. Click in the appropriate area to use the expression editor to choose the appropriate options for your criteria. Based on what you choose, different options will show. Click Tag to create criteria based on tags assigned to your resources. For example, you may want to check the power state of a virtual machine or see if it is tagged as production. Click Find to seek a particular value, and then check a property. For example, finding the Admin account and checking that it is enabled. The filters that you apply will show at the bottom of the report so that you know which filters have been applied. Click on the Summary tab to select sort order, sort type, groupings, and group calculations for the report. Summary groups rows of data based on the sort breaks. You can only sort by fields that display in the report. Set the primary sort in Sort the Report by. Set the next sorts in Within Above Field, Sort By. Select the type of sort, ascending or descending, in Sort order. In Show Sort breaks, select Yes to show the sort breaks, Counts to show sort breaks with the count, or No for no sort breaks. For any numeric field, you can select to show minimum, average, maximum, and total in the sort break. Click on the Charts tab to create a chart for the report. This is not required. Use Choose a chart type to select a type of chart. Note that some charts may not produce the result you are looking for based on the types of fields in the report and its sort order. If you only want to see the top values, select the number of top values from Top values to show. If you want to see the total number of values that are not categorized or evaluated against others, check Sum 'Other' values. Click on the Timeline tab to select a timeline for the report. You must have a field of time or date format to use this feature. Use Base Timeline on to select a column in date or time format for the report. Select a unit of time for the first band in First band unit. Select a unit of time for the second band in Second band unit. Select a unit of time for the third band in Third band unit. Select an Event to position at. Select the range for the event to position from Show events from last. If you select a timeline for a report, that timeline will also show on the timelines page of Cloud Intelligence. The filters that you apply will show on a timeline report so that you know which filters have been applied. Click the Previews tab to see a sample of your report. When you have the report that you want, click Add to create the new report. After the new report is created, to make the report accessible from the report menu, you must add it to a report menu. Use this feature to copy a report that is similar to one that you want to create. By copying a report, you only need to make minor edits instead of creating an entirely new report. Click the Reports accordion and select the report that you want to copy. Click (Configuration), then click (Copy this report). On the Columns tab, edit the Basic Report Info area to include a new Menu Name. Each Menu Name must be unique. Make any other changes you need. See "Adding a Report" for details on the changes you can make. If you find that a report is not giving you the data that you need, you can edit it after it has been created. Note that only reports that you have created can be modified. Only administrators and super administrators of Red Hat CloudForms can add, copy, edit, and delete reports. Navigate to Cloud Intelligence → Report. Click the Reports accordion and select the report you want to edit. Click (Configuration), (Edit this Report). Delete reports when you find that they are no longer useful. Only administrators and super administrators of Red Hat CloudForms can add, copy, edit, and delete reports. Note that only customer-created reports can be deleted. Click the Reports accordion and select the report you want to delete. Click (Configuration), (Delete this Report from the Database). The Delete this report from the Database option will only appear on reports you have created. Default reports cannot be deleted. 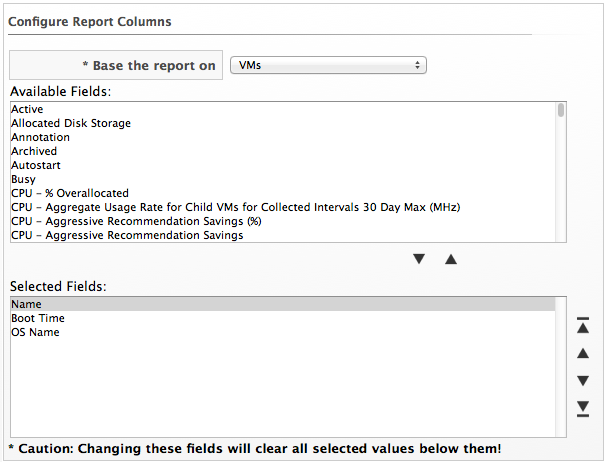 Reports are stored in the VMDB; however, you can share customized reports among VMDBs. To do this use the export and import feature of reports. In the Import/Export accordion, click Custom Reports. To overwrite an existing report with the same menu name, select Overwrite existing reports. Click Upload to import the report to the Company-Custom folder. In the Export area, select the reports to export. By default, all account roles have the same reports available. If you have the super administrator or administrator role, you can customize the accordions, the folders within them, and the locations of your reports. When you create your own report, the report is not automatically available. You must add it to a report menu. Accordions that are general categories for the reports. The defaults supplied are Configuration Management, Migration Readiness, Operations, VM Sprawl, Relationships, and Events. Folders that are used to further organize reports within an accordion. For example, under the Configuration Management, there are folders for virtual machines, hosts, and other virtual infrastructure components. Reports that are stored directly in the folders. Click the Edit Report Menus folder. Click the role whose menus you want to customize. Click on Top Level to organize, add, and delete folders. Click (Move selected folder to top) to move the folder to the top of the list. Click (Move selected folder up) to move the folder up. Click (Move selected folder down) to move the folder down. Click (Move selected folder to bottom) to move the folder to the bottom of the list. Click (Delete selected folder and its contents) to delete a folder. Click (Add folder to selected folder) to add an folder. If you are creating a new folder, Top Level must be selected under Reports. Be sure to select the folder you want to create a subfolder for on the left pane. To name the folder, double-click on New Folder, then click on Top Level in the Reports area. When you are finished adding folders, click Commit. To revert, click Discard. The new folder is added, and you can add folders in which to store reports to it. You can also organize the reports into folder that are meaningful to you. Log in to the console as a user who is assigned either the super administrator or administrator account role. Click the Edit Report Menus accordion. Click on the accordion name you want to organize or add folders to. Click (Delete selected folder and its contents) to delete an folder. Click (Add subfolder to selected folder) to add a folder. When creating a subfolder, be sure to select the folder that you want the subfolder to show under. To name the folder, double-click on New Folder. When you are finished making changes click Commit. To revert, click Discard. Only reports that are not already in another folder can be assigned. Expand the Report accordion and menus using the triangles to the left of the item name until you are able to select the subfolder where you want to put reports. To add a report, select a report from the Available Reports area on the right and click (Move selected reports left). To remove a report from a folder, select the report from the Selected Reports area and click (Move selected reports right). To move a report to the top of the folder, select the report and click (Move selected reports to top). To move a report up one place in the folder, select the report and click (Move selected reports up). To move a report down one place in the folder, select the report and click (Move selected reports down). To move a report to the bottom of the folder, select the report and click (Move selected reports to bottom). When you are finished making changes click (Commit report management changes). The changes are made. The next time a user with this Account Role logs in, the new report and menu structure will be displayed. Usage provides a targeted view of CPU, RAM, disk space, disk I/O, and network I/O for tagged virtual machines. This allows you to find which virtual machines are using or overusing resources. You must assign tags to the virtual machines that you want to collect usage data for. See Tagging Virtual Machines and Templates in Managing Infrastructure and Inventory. Capacity and utilization collection must be enabled. For more information on configuring capacity and utilization charts, see Capacity Planning in the Deployment Planning Guide. Navigate to Cloud Intelligence → Usage. In the Options area, select a Date. More choices will display. From Period, select either Day or Hour. If you select Hour, you will be prompted for which hour in UTC time. From Category, select the category for the tag. From Entry, select the tag from within the category that you want usage data for. The chargeback feature allows you to calculate monetary virtual machine charges based on owner or company tag. To use this feature you must be collecting capacity and utilization data. 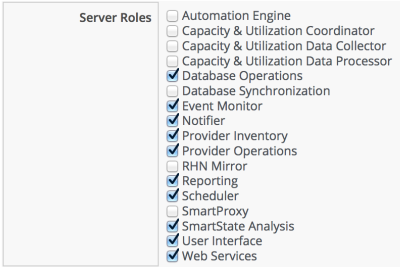 For information on server control settings and capacity & utilization collection settings, see General Configuration. Red Hat CloudForms provides a default set of rates for calculating chargeback costs, but you can create your own set of computing and storage costs by navigating to Cloud Intelligence → Chargeback and clicking the Rates accordion. You can configure chargeback rates for various resources by selecting either Compute or Storage in the Rates accordion. Compute sets chargeback rates for CPU, disk I/O, fixed compute cost, memory, and network I/O items, while Storage sets chargeback rates for fixed storage cost and disk storage. Chargeback costs are computed using a set formula based on hourly cost per unit and hourly usage. Chargeback rates can be assigned at a single rate or by tiers, where rates are assigned in ranges depending on level of usage. Additionally, chargeback can be calculated at one fixed rate, or by a combination of fixed and variable rates per tier. Fixed rates are charged once per unit of time, and the variable rate is calculated by the level of usage multiplied by the number of resources used in a unit of time. Memory costs can be measured in B, KB, MB, GB, or TB. In a scenario where 9.29 GB of memory is used in a day with the chargeback rate set at one dollar ($1) per megabyte per day, the Memory Used Cost would be $396.42. The CPU Total Cost is defined as the number of virtual CPUs over the selected interval (hour, day, week, month). CPU costs can be measured in units of Hz, KHz, MHz, GHz, or THz, as specified when creating a chargeback rate. In a scenario where 16 CPUs are used in a day with the chargeback rate set at one dollar per CPU per day, the CPU Total Cost would be $16. The CPU Used Cost is defined as the average CPU used in MHz over the selected rate interval (hour, day, week, month). CPU Used Cost is not supported for containers providers. In a scenario where 2.5 GHz is used in a day with the chargeback rate set at $0.01 per MHz per day, the CPU Used Cost would be $25. The Storage Allocated Cost is defined as the Allocated Disk Storage in bytes over the selected rate interval (hour, day, week, month). Storage costs can be measured in B, KB, MB, GB, or TB. In a scenario where 500 GB are used in a day with the chargeback rate set at $0.10 per GB per day, the Storage Allocated Cost would be $50. The Storage Total Cost is defined as the Used Disk Storage in bytes over the selected rate interval (hour, day, week, month). In a scenario where 250 GB are used in a day with the chargeback rate set at $0.10 per GB per day, the Storage Total Cost would be $25. The Storage Used Cost is defined as the Used Disk Storage in bytes over the selected rate interval (hour, day, week, month). In a scenario where 250 GB are used in a day with the chargeback rate set at $0.10 per GB per day, the Storage Used Cost would be $25. Red Hat CloudForms allows you to create your own set of computing and storage costs to use for billing. Chargeback rates can be configured at a single rate or in tiers, where one rate is assigned to one usage range, and another rate is assigned to a different usage range. You can also assign fixed and variable rates per tier if desired. There are three methods to create a chargeback rate: editing or copying an existing rate, or creating a new rate. Navigate to Cloud Intel → Chargeback. Click the Rates accordion and select an existing rate from under Compute or Storage. Click (Configuration) and (Edit this Chargeback Rate). Edit the rate as desired. Click Save at the bottom of the screen to save the chargeback rate. Click (Configuration) and (Copy this Chargeback Rate). Click Add at the bottom of the screen to save the chargeback rate. Click the Rates accordion and select Compute to create a CPU chargeback rate. Click (Configuration) and (Add a new Chargeback Rate). Type in a Description for the chargeback rate. In Per Time, select Hourly. In Range, specify the CPU range: Start remains as 0.0 and Finish is 2. In Rate, specify 1 for the Fixed rate, and 0.5 for the Variable rate. Click Add under Actions to create a new, blank Allocated CPU Count line for tier 2. In the new line in Range, specify the CPU range: Start is 2 and Finish is 4. In Rate, specify 0.8 for the Fixed rate, and 0.4 for the Variable rate. Click Add under Actions to create another new, blank Allocated CPU Count line for tier 3. In the new line in Range, specify the CPU range: Start is 4 and leave Finish as Infinity. In Rate, specify 0.6 for the Fixed rate, and 0.2 for Variable. The rate can now be assigned. Red Hat CloudForms allows you to assign chargeback rates by choosing from Compute and Storage. Navigate to Cloud Intelligence → Chargeback. Click the Assignments accordion, and click either Compute or Storage. Use Compute to assign a compute chargeback rate. You can assign chargeback rates to The Enterprise, Selected Clusters, Selected Infrastructure Providers, Tagged VMs and Instances, or Tenants. Use Storage to assign a storage chargeback rate. You can assign chargeback rates to The Enterprise, Selected Datastores, Tagged Datastores, or Tenants. From the Basic Info area, use the Assign To list to select a type of assignee to assign the rate set to. The options displayed vary based on the type you selected. For each item to set, select the chargeback rate to use. The rate is assigned. The next time you generate a chargeback report, these values will be used. When viewing chargeback, there is a rate for a virtual machine for the number of the CPUs. The chargeback for this parameter is calculated based on when the virtual machine is running. If the virtual machine is not running, then it is not charged for CPU allocation. Red Hat CloudForms allows you to create chargeback reports to monitor costs you charged. Click (Configuration), (Add a new Report). On the Columns tab, fill out the Basic Report Info area. Type the Title to display on the report. From the Base the report on list, select Chargebacks. Select the fields to include in the report from the Available Fields list, then click (Move selected fields down). In addition to the fields, you can also select any tags that you have created and assigned. Change the order of the fields in the report by clicking (Move selected fields up) or (Move selected fields down)]. Click the Formatting tab to set the size of paper for a PDF and column header format. From the PDF Output area, select the page size from the Page Size list. From Specify Column Headers and Formats, type the text to display for each field. For each numeric field, you can also set the numeric format. Click the Filter tab to set filters for the data displayed in the report. From Chargeback Filters, select how you want the costs to show, the tag category, the tag, and how you want the items grouped. From Chargeback Interval, select the time interval. You must have a full interval worth of data in order to select an option other than Partial in the Daily Ending With list. Click the Preview tab, and then Load to see what the report will look like. When you are satisfied that you have the report that you want, click Add to create the new report. The new report is created. To make the report accessible from the Report menu, you must add it to a report menu. You can use timelines to view the history record for virtual machines. Amazon does not provide events, so Red Hat CloudForms does not support timelines for virtual machines hosted by Amazon. Navigate to Cloud Intelligence → Timelines. From the accordion on the left, click a category of Timeline. Select Configuration Management to see when items were brought under management. Select Events to view timelines related to operations and changes in configuration. Drag the relevant time band, such as hour, day, or month to go to the time you want to see. Some timelines, such as Events Operations: All Events, use minutes, hours, and days instead of going back only 30 days. To see more detail for a resource in the timeline, click on it. A balloon appears with a clickable link to the resource. You can download timeline data for further analysis or printing. Navigate to Cloud Intelligence → Timelines, and click the timeline you want to download. Click on the download button for the format you want. Click (Download this Timeline data in text format) to download as text. Click (Download this Timeline data in csv format) to download as a comma separated file. Click (Download this Timeline data in PDF format) to download as PDF. Click the Settings accordion, and select the Red Hat CloudForms server. From the Server Control tab, select the Notifier role. In this section, the basics of creating an Alert are described. Detailed instructions for the specific types of Alerts are given in the sections following. To send emails or SNMP traps from the Red Hat CloudForms server, you must have the Notifier server role enabled and have set up SMTP email or SNMP traps. For further information, see General Configuration. Navigate to Control → Explorer. Click the Alerts accordion, then click (Configuration), (Add a new Alert). Type in a description for the alert. Check Active when you feel that the alert is ready to be enabled. From Based On, select the type of infrastructure item to base the alert on. The options shown in What to Evaluate change based on what you selected in Based On. In Notification Frequency, select how often you want to be notified if the event log threshold is reached. The parameters available are based on the What to Evaluate selection. See the following sections for additional details on each alert type. To send an email, check Send an E-mail. Parameters required for sending an email are displayed. In From, type in the sending email. Use Add a Red Hat CloudForms User to select a user. The Red Hat CloudForms user must have a valid email address entered under accounts. Use Add (enter manually) to type in the address not registered to a Red Hat CloudForms user. Then, click (Add). If you check Send an SNMP Trap, type in the IP for the host to send the trap to, select the version of SNMP that you are using, and type in the Trap Object ID. Type in multiple hosts if you need the trap sent to multiple SNMP hosts. If using SNMP V1, you will be prompted for a Trap Number. Type 1, 2, or 3, based on the appropriate suffix number from table below. 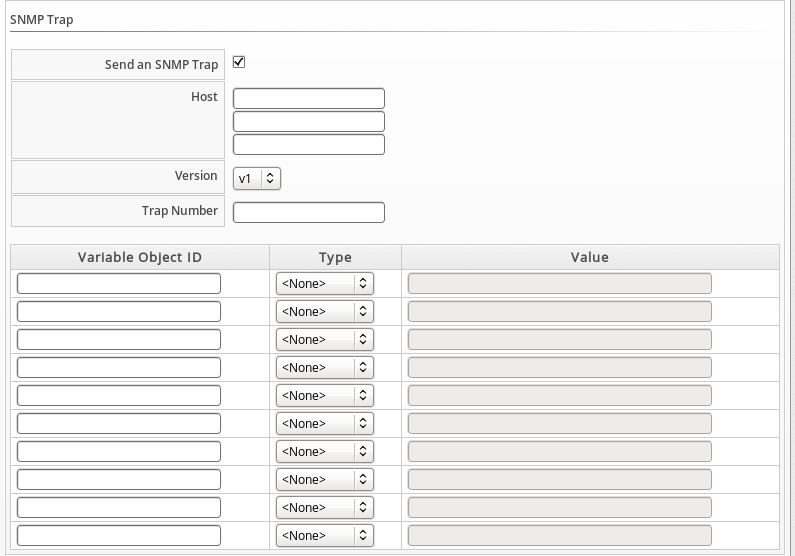 If using SNMP V2, you will be prompted for a Trap Object ID. Type info, warning, or critical, based on the table below. To show the alert as an event on the Red Hat CloudForms timeline, check Show on Timeline. It shows as part of the Alarm/Status Change/Errors category. To invoke automation, check Send a Management Event. Type in the name of the event. This item exists in the Process/Event Class. Use a hardware reconfigure alert to detect changes to the amount of memory or the number of CPUs on a virtual machine. From Based On, select VM and Instance. From What to Evaluate, select Hardware Reconfigured. In Notification Frequency, select how often you want to be notified if hardware reconfiguration is detected. From Hardware Attribute, select Number of CPUs. From the next dropdown, select Decreased. After setting the parameters, select what you want the alert to do. You can send an email, create an SNMP Trap, let the alert show on the timeline, or send a management event to start an automation process. Normal operating range alerts enables you to be notified when the normal operating range is exceeded, or falls below for a period of time from 1 minute to 2 hours. Capacity and utilization must be enabled for normal operating ranges to be calculated. See General Configuration for more information. For What to Evaluate, select Normal Operating Range. In Notification Frequency, select how often you want to be notified if the performance threshold is reached. Set the threshold in the Normal Operating Range Parameters area. From Performance Field, select the field to check and whether you want to be notified if the field is exceeded or fell below. In Field Meets Criteria for, select the amount of time that the threshold requires to be met to trigger the alert. After setting the parameters, you then select what you want the alert to do. You can send an email, create an SNMP Trap, let the alert show on the timeline, or send a management event to start an automation process. See Section 7.2, “Creating an Alert”. Real Time Performance alerts enables you to be notified immediately when a performance threshold has been met for a virtual machine, host, or cluster. Capacity and Utilization must be enabled for performance thresholds to be detected. See General Configuration for more information. Click the Alert accordion, then click (Configuration), (Add a new Alert). For What to Evaluate, select Real Time Performance. Set the threshold in the Real Time Performance Parameters area. From Performance Field, select the field to check and any other parameters required for that field. In And is Trending, select Don’t Care if it does not matter how the performance metric is trending. Otherwise, choose from the possible trending options. Set Debug Tracing to true only when directed to do so by Red Hat Support. This provides an extremely detailed level of logging and can result in many more log lines being written. After setting the parameters, you then select what you want the alert to do. You can send an email, create an SNMP Trap, let the alert show on the timeline, or send a management event to start an automation process. Hourly performance alerts enable you to be notified immediately when an hourly performance threshold has been met for a cluster. Capacity and Utilization must be enabled for performance thresholds to be detected. See General Configuration for instructions. Click (Configuration), (Add a new Alert). From Based On, select Cluster. For What to Evaluate, select Hourly Performance. In Notification Frequency, select how often you want to be notified if threshold is met. In the Hourly Performance Parameters area select performance field and the criteria. You can also select options from the And is Trending dropdown box and whether the Debug Tracing is true or false. Use the hostd Log Threshold to send a notification when certain items are found in the event logs for a host. A default analysis profile with event log items is required for this feature. The following example shows steps to check the host’s log for a failure to validate a virtual machine’s IP address. From Based On, select Host. For What to Evaluate, select Hostd Log Threshold. In Notification Frequency, select how often you want to be notified if the log item is detected. In the Hostd Log Threshold Parameters area, select the parameters for the event log message. You can set a threshold for a filter, level, or message source. Use Message Filter to look for specific text in a message. Use Message Level to filter based on message level. Red Hat CloudForms reports on the specified level and above. Use Message Source to filter log messages based on its source. Set How Far Back to Check in days you want to look for this message. If you only want an alert triggered when the log message has occurred a certain number of times, type the number in Event Count Threshold. Red Hat CloudForms can use VMware alarms as a trigger for an alert. This type of alert can be created for a cluster, host, or virtual machine. From Based On, select Cluster, Host, or VM. For What to Evaluate, select VMware Alarm. In the VMware Alarm Parameters area select the provider and alarm. Expression alerts enables you to create a notification based on any possible criteria for clusters, datastores, hosts, and virtual machines. The following procedure creates an alert for when a host’s datastore has less than 5% free space. Click on the Alerts accordion, then click (Configuration), (Add a new Alert). For What to Evaluate, select Expression (Custom). In Notification Frequency, select how often you want to be notified if the expression is evaluated to true. Use the expression editor to create your expression. This is the same expression editor used to create Conditions. For details on how to use the expression editor, see the Policies and Profiles Guide. Click (Commit expression element changes) to accept the expression. From Based On, select Server. Select the appropriate driving event. Alert is raised when an EVM Server starts. Alert is raised when an EVM Server stops. Alert is raised when one EVM server detects that another EVM Server has not responded in (2 minutes). This is a sign of a problem that should be investigated. Check logs. Alert is raised when an EVM server has exceeded its system memory limit and begins killing workers. Default is 80%. Threshold configured in Advanced Settings. The server is running with too few resources. The server is enabled with too many roles or number of workers. The server picked up all the roles because another server has failed. A runaway process has taken up most of the memory. When one EVM Server takes over as a master server. Typically, this should only occur when first starting a set of servers, perhaps following expected outages. If a server picks up as master in other situations, the old master had an issue that needs to be researched (such as server not responding in time). The EVM Servers system disk is 80% full. This check is run as part of a system schedule. Something is filling the disk such as temp files used by the operating system such as, yum updates and normal /tmp files, or EVM temp files in /var/lib/data/miqtemp/. The EVM Servers app disk is 80% full. This check is run as part of a system schedule. Possibly EVM temp files are being left around. The EVM Servers log disk is 80% full. This check is run as part of a system schedule. Logs are getting too big or are not being log rotated properly every day. Check most recent logs. The EVM Servers db disk is 80% full. This check is run as part of a system schedule. Applies if using PostgreSQL as the VDMB. Database or database logging is getting too large. May need FULL vacuuming of PostgreSQL database. Alert is raised when a worker is about to start. Alert is raised when a worker is requested to stop. Alert is raised when a non- responsive worker does not restart on its own and is killed. Alert is raised when a worker has not responded for 2 minutes (:heartbeat_timeout) or has not started within 10 minutes (:starting_timeout). Alert is raised when a worker exceeds the memory threshold. The default is 150 MB, but some workers have their own value in the :memory_threshold section for that specific worker. Alert is raised when a worker has been running longer than the :restart_interval. (Most workers are set to never restart using the 0.hours setting.) The EMS Refresh SmartProxy workers are set to restart every 2 hours. Alert is raised when the scheduler worker exits due to a pending large ntp time change. After creating an alert, you can edit the threshold, expression, or the notification type. Click on the Alerts accordion, then click on the alert that you need to edit. Click (Configuration), (Edit this Alert). You can copy an existing alert to create a new alert that is similar to the existing one, then change the values associated with it. Click on the Alert accordion, then click on the alert that you want to copy. Click (Configuration), (Copy this Alert). Click OK to confirm. When an alert is no longer needed, you can remove it from your VMDB. Click on the Alerts accordion, then click on the alert that you want to delete. Click (Configuration), (Delete this Alert). Click the Actions accordion, then click (Configuration), (Add a new Action). Type in a Description for the action. Select Evaluate Alerts from Action Type. Select the alerts to be evaluated and click (Move selected Alerts into this Action). Use the Ctrl key to select multiple alerts. Alert profiles enable you to create groups of standard alerts. An alert profile can have as many alerts assigned as you need, and can be assigned to clusters, datastores, hosts, and virtual machines. Click on the Alert Profiles accordion, then click on the type of profile that you want to create. Click (Configuration), (Add a new Profile). In the Basic Information box, type in a unique Description for the alert profile. Select the desired alerts from the Available Datastore Alerts area. Use the Ctrl key to select multiple alerts. Click to add the Alerts. Type in any additional description in the Notes area. You can edit an alert profile as your enterprise’s needs change. Click on the Alert Profiles accordion, then click the alert profile you want to edit. Click (Configuration), (Edit this Alert Profile). Remove alert profiles that you no longer need. This does not remove the alerts associated with the alert profile. Click on the Alert Profiles accordion, then click the alert profile you want to remove. Click (Configuration), (Delete this Alert Profile). After an alert profile is created and verified, you can assign it directly to a resource. Click on the Alert Profiles accordion, then click on the alert profile that you want to assign. Click (Configuration), (Edit Assignments for this Alert Profile). The options presented change based on if the alert is for a cluster, datastore, Red Hat CloudForms server, host, or virtual machine and instance. You can assign to the enterprise, to specific hosts, cluster, resource pools, and providers, or based on assign tags. For a Red Hat CloudForms server alert profile, you can only assign to Red Hat CloudForms servers in the current Region. Use RSS to view RSS feeds based on administrative roles. You can subscribe to the RSS feeds and have them delivered to an RSS reader. Navigate to Cloud Intelligence → RSS. Filter the list of RSS feeds by administrative role using the Admin Role Filter dropdown. Red Hat CloudForms provides a set of out of the box reports covering a variety of areas. These fields are collected by Red Hat CloudForms from the different parts of the infrastructure. Most of the fields are named directly as the vendor would name them. However, there are some fields that Red Hat CloudForms calculates given this data. Note that this list may vary by Provider and may change as new Providers are added to Red Hat CloudForms. Also, note that the value returned by each reportable field below is in megabytes (MB).